Unless you're a movie character who needs to end every montage hanging out on the steps of the Lincoln Memorial, most historic DC landmarks are deserving of exactly one visit. 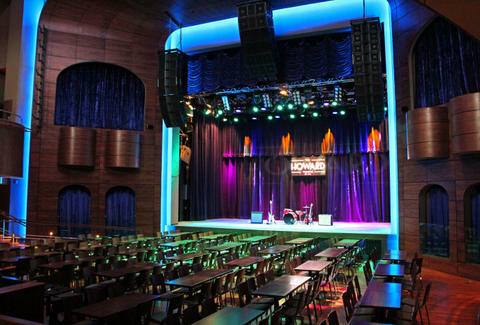 For one you'll want to check out again and again, though: the Howard Theatre. The historic venue that first opened in 1910 and launched Ella Fitzgerald, Marvin Gaye, and The Supremes is back after a 29-million-dollar renovation that, among other things, remodeled the balconied, 650-seat auditorium ("supper club-style seating", black walnut walls), and installed a two-million-dollar acoustic system, so expect all the acts to sound money. To give you an idea of the talent level they're booking: Mos Def and The Roots are playing just this weekend, while upcoming acts include Hoodie Allen, and homegrown heroes Chuck Brown and Bad Brains, which you have if you haven't already clicked the link at the bottom to order tickets. The edible offerings probably cost another 29mil by the way, because they've brought in -- from Harlem comfort food institution Red Rooster -- Marcus Samuelsson, the youngest chef ever to earn two 3-star ratings from the NY Times, who's cooking up finger-lickers like braised short rib w/ pickled cucumber & sweet potato hash, and bearnaise-slathered "T Street Steak Frites". And finally, the cocktails stay on theme with the Hennessy VS/ orange liqueur/ Angostura bitters "Duke", the tequila/ tamarind syrup/ agave "Miles Away", and a black-tea-infused-bourbon/ peach liqueur/ lemon bitters elixir called "The Bird", the flipping of which is also a fine response to someone demanding that you go check out the Lincoln Memorial with them again.